Stressed Out? Need Urgent Help? Don�t have time to read everything? No problem. Get the legal answers and help you need in just minutes. Click Here to Download "No BS DIvorce Strategies For Men" for Just $49.95 and Get 190 pages of insider details on how to get the best possible results for YOUR unique divorce case � starting NOW. Subject: How I Won a Bitter Divorce Case� And You Can Too! Listen, I don�t have to tell you how very cruel and devastating a divorce can be. Financially. Mentally. Emotionally. The life you�ve lived up until this point is about to be turned on its head, punched in the gut, then kicked down a flight of stairs. Or try to follow all the piecemeal legal advice you�ve gotten from well-meaning friends, family and court TV shows. You don�t have to do either of those things � because they aren�t the only answers. 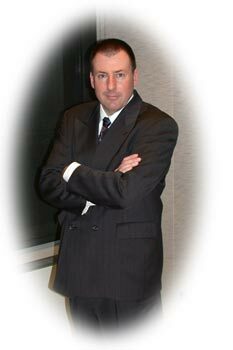 What I�m about to show is GUARANTEED to save you thousands of dollars in legal fees and get you the best possible outcome for your unique case. It�s 100% legal, 100% actionable and you can get started immediately. It�s called "No BS DIvorce Strategies For Men". This detailed 190 page guide walks you through every step of the divorce process from start to finish and gives you insightful, real-world steps to take at every point in your case. And it�s just $49.95. You�d pay about the same for 15 minutes of your lawyer�s time. Because this guide is delivered electronically, you can start learning everything you need to know about successfully managing your unique case, from preliminary filings to final statements, just minutes from now. Click Here and Get Instant Access to All the Answers � Just $49.95. Think you can go it alone? Want to try to manage your divorce settlement yourself? I thought I could handle it, too. I was convinced there was no way I was going to pay an overblown stuffed-shirt some $200+ an hour just so my ex could walk away with everything I owned and everything I loved � including my son and daughter. Do You Know What to Do in These Complicated Legal Situations? When facing Divorce most let their lawyer be the only source of information about divorce laws, then let the lawyers (both yours and hers) negotiate indefinitely over trivial or predetermined matters by swapping letters. Sam J. spent more than $30,000 in legal fees over an eight month period and had nothing to show for it but a bad divorce settlement and a high alimony payment to his ex. After reading "No BS DIvorce Strategies For Men", Sam knew just what to do because there's an entire section addressing all aspects of alimony starting on page 51. Since Sam was facing an alimony threat, he discovered how to pay the lowest amount possible if not eliminate alimony all together. If you're already paying alimony, discover how to legally lower the amount you're ordered to pay and in some cases, eliminate it. Many men hire a lawyer and fight the system hoping to "win" in court. This is akin to trying to change the direction of the wind. Kevin S. was frustrated with the system and was being jerked around by his ex-wife during his divorce. His lawyer wasn't much help. Unfortunately too many men try to change the direction of the wind instead of simply adjusting their sails. Kevin started to take control of his divorce process and the results were immediate. 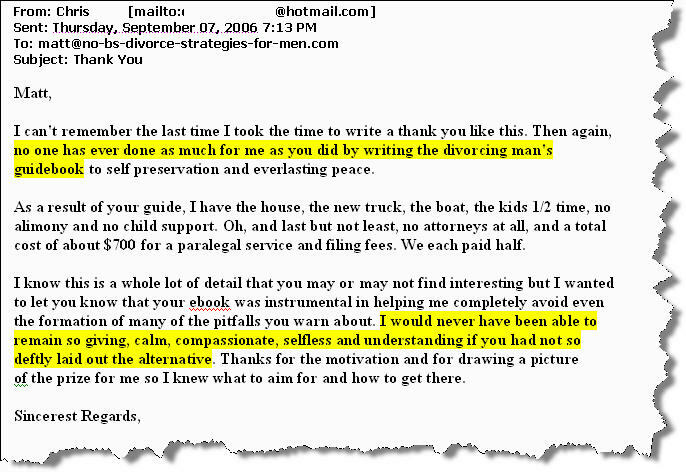 Using strategies on Pages 26, 70, and 123, he was able to manage is lawyer and settle is divorce with low child support and zero alimony. When you don't understand the rules of the game, divorce can be frustrating, difficult, and costly. Once you understand how the divorce game is played, the system becomes quite predictable. Your wife and her Lawyer demand Child Support well beyond what you could pay given your curent income. Greg N. was faced with high child support and outrageous demands from an angry ex-wife and her attorney that would have left him destitute for years. Greg used a technique from page 163 to arrive at a child support amount that was much lower than his wife's amount. Greg also discovered on page 175 how to turn the court in his favor. This stopped his ex-wife dead in her tracks. That was the end of the argument! "No BS DIvorce Strategies For Men" has several chapters dedicated to helping men legally pay the lowest child support possible and getting the courts to agree. But you SHOULD be worried � because your divorce lawyer is going to charge you up to two hundred dollars an hour not only to answer your questions but also entangle you with costly, time-consuming roadblocks designed to run up your bill. Your lawyer isn�t getting paid on whether he wins or loses your case. They don�t even care whether you win or lose, because chances are after your divorce is settled, you�re not going to be needing their services again (or at least, I hope not!). So that lawyer is going to file briefs and file motions (which rarely get read or acted upon) and generally squeeze every drop of time they can out of your wallet. That�s on top of whatever financial issues get negotiated in the actual divorce (such as alimony or child support). Not only is it like a financial kick in the groin, it�s a mind-numbing kick in the teeth. Want to Keep More of Your Hard-Earned Money in YOUR Pocket, Instead? "No BS Divorce Strategies For Men" can make it happen � and you can start using this invaluable advice right away. Even if you already have a lawyer and you�re happy with them, I can show you how to make sure they work hard for their money � just like you do. How to force your lawyer to work more efficiently on the things that can actually bring your divorce settlement to an easy, fair and quick resolution (This is the kind of stuff NO attorney is going to tell you � but it will save you THOUSANDS). Pages 35-37. How to calculate realistic, reliable child support payments in minutes � right down to the exact cent. Know what you owe and be able to step up to your responsibilities with confidence (this will throw HER divorce attorney for a loop!) Pages 125-127. How to uncover deep-seated bias, corruption and distrust in the courtroom, and why men unfairly get the short (pointed and barbed) end of the stick when it comes to divorce and child custody. Know what to expect - and how to turn the results in your favor with these little-known tricks. Want full custody of your child? Then DON�T Say This� You�d think it would put the odds in your favor, but it will just add more fuel to her lawyer�s fire � and it could land you in a lot of hot water. 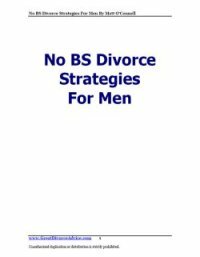 "No BS Divorce Strategies For Men" is filled with over 190 pages of honest, straightforward, no-holds-barred divorce truths and step-by-step actions any man can take to get the best possible results � no matter what your divorce situation. Just get in touch with me (my email is below) and I�ll buy the guide back from you! It�s that simple. No hard feelings and no questions asked. That�s how dedicated I am to giving you the most straightforward, simple and satisfying resolution you can get for your divorce case. Placing an order online is quick, secure and convenient. Just minutes from now you�ll be able to save the entire guide right to your computer, notebook or smartphone for easy reading. I�ll even give you step-by-step directions to help. Once you click the link below, you�ll be taken to a page where you�ll enter your payment details and then go through the checkout process. This information is confidential and secure at all times and neither I, nor your credit card processor will have access to your financial details once you checkout. Your credit card statement will reflect a charge from Authorize.net. Men everywhere are talking about No BS Divorce Strategies For Men, and it�s no surprise why. Once you see the detailed, step-by-step, easy to follow tips and tactics outlined in this do it yourself guide, you�ll feel more confident, determined and ready for whatever her lawyer can throw at you! This isn�t just about you, her, your family or your possessions. It�s about getting equal justice, fair representation and making sure your self-serving lawyer doesn�t siphon off fistfuls of your cash for his new yacht. Remember you get a full 6 months to try out all this information, with absolutely no risk. Don�t think it will work for you? Just let me know and the money�s yours. But I�m confident once you see just how much helpful the information I�ve poured into this 190-page guide is you�ll be convinced it was the best investment you�ve ever made in getting your life back on track. P.S. I am not a lawyer, but I do know how to help you save money on yours. Imagine stuffing your pockets with an extra $200 every hour you save by not having a bunch of useless filings and briefings made that go straight into the circular file. I can show you exactly what you or your lawyer needs to say and do to get you the best possible results for your unique case. And for only $49.95, it�s a small cost that can make a huge difference.